Favourite food: I like Pasta! I am somewhat confused here, but i'll do my best to explain this. Is it neseccary for a "Firewire audio interface" to have a MIDI input jack in order to send midi data from a keyboard (or e-drum module in my case) into a DAW? Btw, I've never used midi, or had a use for it. But i'd like to CONTROL some plugin's, vst's and softsynths within the DAW using my keyboard.. but just noticed that the interface i'll be getting doesn't have any midi inputs (this isn't a big deal for me, since i record straight audio always) but i'd like to use midi perhaps down the line. Audio ins/outs are completely different thing than MIDI ins/outs. You know what U're sending with audio, but with MIDI U're just sending information about notes, duration, etc...so on playback MIDI module (hard or soft) plays exactly what U did before. Or, for example, U can record melody info (in sequencer) with piano sound, but can later change this sound on playback: same MIDI recorded melody played with whatever sound your module has. - If U have one of latest keyboards there's probably USB interface, it can be used instead of MIDI cables directly to PC, with driver of course. - Maybe U have other audio card in PC, no need to be expensive, U just need MIDI-game port(joystick) adapter, MIDI cables and driver. - You could also buy USB to MIDI interface for computer, not very expensive. Yamaha has one, too. For the keyboard I have midi in's an outs, BUT it also has a USB jack, which im pretty sure can be used as midi. No Problem There. then if i run the usb end to just the usb input of my computer should it work fine in my DAW? Yes, you can record whole MIDI pad performance into DAW and then play each part one by one. Once you have MIDI tracks in DAW I'm sure you can also find better/different drum sounds in software sample world. About USB/MIDI cable, it's ok if it has some kind of driver (it really looks like simplest cable on jour pic, I'm sure there must be small chip hidden somewhere:). In DAW control panel U must select MIDI interface and that's all, you have MIDI IN/OUT for your DAW. This IS interface, no need for other if only using one MIDI IN and OUT. Looks like it has a "interface" in the middle. Never knew they could be so small. As long as it works tho! I have a M-Audio 410 firewire that has less then an hour on it that has firewire AND midi in/out jacks which does bidirectional audio AND midi. Firewire to the host vomputer. Midi jacks to the controller or drum machine , etc. Audio and midi are transfered to the host via firewire or audio cable. To bad there are no firewire to midi cord adaptor cords like there are USB to midi. The only reason I'm not using my 410 anymore is I have a direct firewire inteface adaptor card in my CME keyboard controller and run that to my host computer, USB just jas too much latency. I'ld take 100 bucks + shipping for the 410 if yer intersted. Then all you need is one Firewire cable and two midi cables. msg, sorry for ruining your business but I think this problem is solvable with much less money. Now, U might be right about possible firewire and USB conflict - I never tried this combination at the same time in single PC - but USB alone is at least 100x faster than needed for MIDI. There are multichannel audio/MIDI USB interfaces on the market and it's true there are some problems with them, but not because of MIDI. It's just few 10 Kb's needed for sendinig MIDI info via cable. It all depends on drivers and how well computer system has been setup. Now, feeling guilty for ruining msg's business (100bucks for 410 is fair price), I'd take it myself if I was in US.. There is both speed and response time to be taken into consideration. Response time sometimes is a problem. Sometimes. Yes, that's true, but with good setup and well known products this should be past. Sometimes just simple disconnecting of other USB devices (like printers) helps, too. But in fact you're proving my point... sometimes disconnecting the printer helps, sometimes different memorysettings, sometimes this, sometimes that,... and sometimes different hardware... and sometimes nothing. With a good technical knowledge like yours you should be able to work your way to a decent setup, but most people can't. And a lot of people can if they are lucky. And a lot of people run into a situation where it works now, and doesn't later, for inexplicable reasons. That is all due to an operating system that is 1) FAR too complex to host this type of application, 2) is not made for real-time applications, 3) has a lot of problems of its own, 4) Intended to be hardware-independent. Anyone can say that the effects (etc) of the G are mediocre (with which I don't agree), it has nothing to do with the G's application software that is a staggering 4 Megabytes. It contains everything. A dedicated application on a dedicated OS with dedicated hardware. 4 Megabytes... the complete G software fits in your PC's working memory a thousand times. ...And a lot of people run into a situation where it works now, and doesn't later, for inexplicable reasons. Exactly! People who start using MIDI today - in time of superfast processors, huge memory, complex software, etc etc - probably aren't familiar with fact MIDI hasn't changed a lot in 20+ years. Anyone who used old Atari knows that. I'm still missing my "vintage" HP 286 PC with MS-DOS for midi - don't laugh - it worked like a Swiss clock! All written before counts here, too: Driver and good clean system setup. Oh I can relate to your 286 DOS story! We had a token ring network back then (in excess of $ 25K per unit) using a token ring network. It was either 2 or 4 Mbit, I don't recall. But it was so incredibly stable and responsive. I think Windows is a great environment for consumers and not for producers. We're too close to the latter. Nothing's ruined .........except a USB cable ain't gonna fit into the firewire socket on the unit picture unless I've lost me vision too. BTW I also have a Tascam US-122 interface that does have USB and midi jacks for the same price. Most sound cards have a joystick port. In most cases this port also doubles as a midi port. It'll be like a 11 pin rectangular kind of deal. (not sure how many pins exactly)... anyway, you set your DAW up to listen to it... plug your keys into it with whatever 7 dollar cable fits (it'll have a rectangular end and the other side has two round midi jacks like your pictures)...make sure all your midi channels match and you're done. I know of many people using usb interfaces to their computers, no latency problems. However firewire is always better. Usb interfaces are a thing of the past they still work tho! All I want to do it record the midi coming out of my TD-9 drum module instead of raw audio so i can manipulate it later easier in the DAW. Would i need a interface for that? wouldn't it be enough just to have the cable send midi data? Just read my first post again and choose one of 3 options. 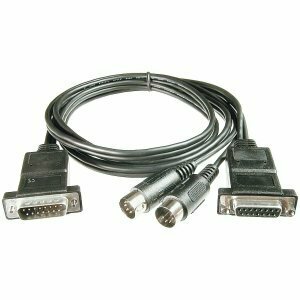 Like beer wrote, the cheapest is Joystick-Gameport/MIDI adapter (don't know if your Mac has this port, see my pic of cable above), then USB-MIDI cable. If your keyboard sends MIDI through USB and also has MIDI INS/OUTS, you could send drum module MIDI through keyboard and then with USB cable to Mac. Possible MIDI latency problems here, also don't know if your keyboard MIDI work both ways at the same time. I never thought of that, I could run the drum module into my Korg keyboard and then into my daw! perhaps i'll try that down the road! i'll take the easier routes first tho.. and figure something out. Yeah, and your drum machine could then play all your keyboard drums sounds too!